A 32-year-old woman was so happy listening to Pharrell Williams song of the same title that she posted to Facebook: “The happy song makes me happy.” The only problem was that she was reportedly driving on a North Carolina highway at the time. 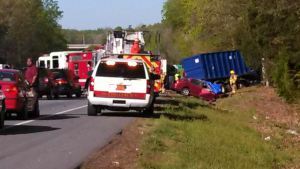 Police say that they received a 911 call about an accident just one minute after Courtney Ann Sanford’s 8:33 a.m. posting on April 24th. She was killed when her car crashed into a truck. It was reported that the police found she had also been posting selfies prior to the accident. This is another sad reminder of the dangers of texting and driving. Does a story like this make you think twice the next time you are tempted to post or text while driving? Isn’t it worth waiting until you can safely share your experience–your life and the lives of others could depend on it. What do you think?